Some print campaigns are just so odd they make you stop and look. This Killer Jeans effort is one such campaign. Touting its Immortal Jeans line, we've got a Disney Test Track/crash test dummy-style approach with the required auto babe. We've got the hipster base jumper and we've got a mine sweeper crew. Get it? Dangerous situations? Killer Jeans? Good. We didn't want to have to spell it out for you. Bates Enterprise Mumbai created the campaign. Maybe it's like Advertising Age or CNN.com who think people only use Microsoft propietary products. The success story of Killer jeans is not by chance or by luck. behind its success there are lots of efforts and hardworkings. in 1989, when the company had launched its flagship brand Killer, they had a vision and commitment towards the community that to provide the best fits, washes, and fashion at a very affordable price. 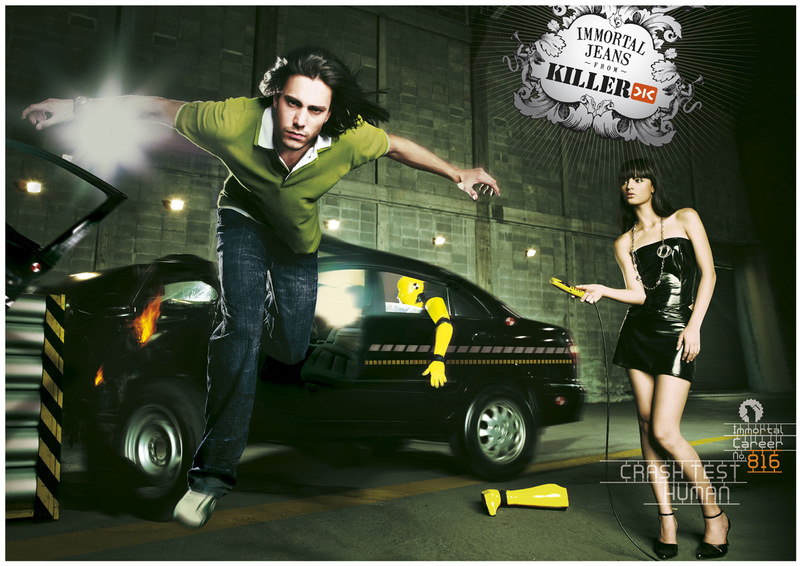 Despite of many international brands available in the market, Killer is the only Indian denim brand which survived and still growing well. The idea of its survival in the market is to complete product development time by time, innovation by keeping its strengths which are the fits and the washes. None of the other brand can compete killer in terms of washes and the fits. Jeans and casual wear company Trigger has introduced a new luxury sub-brand called Black Gold to its fashion lines. Designed for both men and women and launched for autumn 2008 at New York Fashion Week in February 2008, Trigger Black Gold, a self-standing, casual-luxury collection, will compete above the mainline and sell alongside luxury Trigger range Gallery.